Mitski Miyawaki (born September 27, 1990), known simply as Mitski, is a Japanese American singer-songwriter and musician who embarked on her musical career while studying at Purchase College's Conservatory of Music, during which she self-released her first two albums: Lush (2012), and Retired from Sad, New Career in Business (2013). After graduating, Mitski released in 2014 her critically acclaimed third studio album, Bury Me at Makeout Creek through Double Double Whammy. It was followed by Puberty 2 (2016) and Be the Cowboy (2018), released on Dead Oceans to further acclaim. Mitski Miyawaki was born on September 27, 1990, in Japan to a Japanese mother and American father. She grew up surrounded by her father's Smithsonian folk recordings and mother's 1970s Japanese pop CDs. Because of her father's job, which she prefers to not disclose, she and her family moved frequently, living in thirteen countries, including Turkey, China, Malaysia and the Democratic Republic of Congo, before eventually settling in New York City. After enrolling at Hunter College to study film, she decided to pursue music instead and transferred to Purchase College's Conservatory of Music, where she studied studio compositions. During her time at Purchase College, she recorded and self-released her piano-based first and second albums, Lush (2012) and Retired from Sad, New Career in Business (2013), as student projects. After graduating, she served as the vocalist for the short-lived prog-metal band Voice Coils and began work on her third studio album, Bury Me at Makeout Creek, which was released on November 11, 2014, through Double Double Whammy. The album represented a sonic departure from Mitski's orchestral and classical piano background found in her first two albums, exchanging it for raw, impulsive guitar. It garnered critical acclaim from numerous publications. On December 22, 2015, Mitski signed with Dead Oceans before releasing new music the following year. She announced her fourth studio album, Puberty 2, on March 1, 2016, and shared the lead single, "Your Best American Girl". She released another single, "Happy", before the release of the album on June 17. The album was recorded over a two-week period at Acme Studios in Westchester County, New York and was produced by longtime collaborator Patrick Hyland. The album received widespread acclaim from music critics. On February 21, 2017, the Pixies announced US tour dates with Mitski as a supporting act. On May 1, a compilation album consisting of 100 songs by different artists titled Our First 100 Days was released. It includes Mitski's cover of One Direction's song "Fireproof". The compilation aims to raise funds for organizations that support causes threatened by Donald Trump's proposed policies. Mitski played a cover of the song back in 2015, but that version has since been taken down. Mitski also covered Frank Sinatra's 1951 classic "I'm a Fool to Want You" for the 7-Inches For Planned Parenthood compilation album. On October 4, Lorde announced Mitski will be an opening act for selected dates as part of her Melodrama World Tour. On November 1, a short film starring Mitski called Sitting was released. On April 20, 2018, Mitski teamed up with the experimental band Xiu Xiu on the song "Between the Breaths" for the soundtrack of the sci-fi comedy film How to Talk to Girls at Parties, based on the short story of the same name. On May 14, 2018, Mitski's fifth studio album, Be the Cowboy, was made available for pre-order without prior announcement. The lead single, "Geyser", was released on the same day alongside its accompanying music video. The second single, "Nobody", was released on June 26 accompanied by a music video, and the third and final single to precede the album, "Two Slow Dancers", was released on August 9 alongside a lyric video. Be the Cowboy was released on August 17, through Dead Oceans. The album was critically acclaimed and awarded the honour of Album Of the Year by various major online music publications including Pitchfork , Vulture and Consequence of Sound. Mitski reflects her cross-cultural identity as "half Japanese, half American but not fully either", a feeling that is often reflected in her music, which occasionally discusses issues of belonging. Mitski expressed the tension of being a private person and her discomfort with the attention that comes with being in the public eye, therefore preferring to keep her personal life private. List of studio albums, with selected details and chart positions. List of extended plays, with selected details. "First Love / Late Spring"
"I'm a Fool to Want You"
"Because Dreaming Costs Money, My Dear"
^ a b "Puberty 2". Dead Oceans. June 17, 2018. Retrieved June 27, 2018. ^ "Taking All of Mitski". Impose Magazine. Retrieved March 11, 2017. ^ "In Sight Out: Mitski". Pitchfork. September 19, 2017. Retrieved June 28, 2018. ^ a b Donelson, Marcy. "Mitski | Biography & History". AllMusic. Retrieved June 27, 2018. ^ "Voice Coils = prog metal from mems of Mitski, Roomrunner, Extra Life, Porches & more, playing 7" release show at DbA". BrooklynVegan. September 12, 2014. Retrieved August 11, 2018. ^ "Mitski:Bury Me At Makeout Creek Album Review". Pitchfork. November 14, 2014. Retrieved February 9, 2016. ^ "Premiere - Brooklyn Newcomer Mitski's Spellbinding 'I Will'". NME. 2014-10-21. Retrieved January 11, 2016. ^ "Bury Me At Makeout Creek Album Review". Rolling Stone. December 18, 2014. Retrieved February 2, 2016. ^ "Holding the Audience Hostage, With a Wail;Mitski Leaves Her Mark at the Knitting Factory". The New York Times. December 19, 2014. Retrieved February 9, 2016. ^ "New Artist // Dead Oceans Signs Mitski". Dead Oceans. December 22, 2015. Retrieved June 27, 2018. ^ a b "Mitski announces new album, Puberty 2, shares lead single "Your Best American Girl"". Consequence of Sound. March 2, 2016. Retrieved March 11, 2017. ^ a b "Mitski was "Happy" once on new single — listen". Consequence of Sound. May 3, 2016. Retrieved March 11, 2017. ^ "Q&A: Mitski Goes Back To Her Roots On Puberty 2". 8 June 2016. ^ "Reviews for Puberty 2 by Mitski". Metacritic. Retrieved December 23, 2016. ^ "Pixies Add U.S. Tour Dates With Mitski". Pitchfork. February 21, 2017. Retrieved June 27, 2018. ^ a b "Our First 100 Days". Bandcamp. Retrieved May 15, 2018. ^ "Mitski Covers One Direction's "Fireproof": Listen". Pitchfork. April 7, 2017. Retrieved May 15, 2018. ^ a b Gray, Julia (October 19, 2017). "Mitski – "I'm A Fool To Want You" (Frank Sinatra Cover)". Stereogum. Retrieved June 26, 2018. ^ Strauss, Matthew (October 4, 2017). "Run the Jewels and Mitski Touring With Lorde". Pitchfork. Retrieved June 27, 2018. ^ Sodomsky, Sam (November 1, 2017). "Mitski Stars in New Short Film SITTING". Pitchfork. Retrieved June 27, 2018. ^ a b Yoo, Noah (April 20, 2018). "Mitski Links With Xiu Xiu for New Song "Between the Breaths"". Pitchfork. Retrieved June 26, 2018. ^ a b c Boilen, Bob (May 14, 2018). "Mitski Shares And Talks About New Song And Album". NPR. Retrieved May 14, 2018. ^ a b c "Mitski Presents New Single, "Nobody", and Accompanying Video". Dead Oceans. June 26, 2018. Retrieved June 26, 2018. ^ a b Daramola, Israel (August 9, 2018). "Mitski – "Two Slow Dancers"". Spin. Retrieved August 9, 2018. ^ "Be the Cowboy by Mitski on Apple Music". Apple Music. Retrieved May 14, 2018. ^ "The 50 Best Albums of 2018 - Page 5". Pitchfork. Retrieved 2019-03-12. ^ Jenkins, Craig (December 3, 2018). "The 15 Best Albums of 2018". Vulture.com. Retrieved 2019-03-12. ^ "Top 50 Albums of 2018". Consequence of Sound. December 3, 2018. Retrieved 2019-04-06. ^ Caramanica, Jon (June 2, 2016). "Mitski's 'Puberty 2' Mines Her Scars for Raw Meaning". The New York Times. Retrieved October 16, 2016. ^ "Mitski - Be The Cowboy". ultratop.be. Retrieved 2018-08-25. ^ "Mitski Chart History: Canadian Albums". Billboard. Retrieved August 28, 2018. ^ "IRMA – Irish Recorded Music Association". www.irma.ie. Retrieved 2018-08-25. ^ "Official Scottish Albums Chart Top 100". Official Charts Company. Retrieved 2018-08-25. ^ "MITSKI | full Official Chart History". Official Charts Company. Retrieved 2018-08-25. ^ "Mitski Chart History: Billboard 200". Billboard. Retrieved August 28, 2018. ^ "Mitski – Chart history: Alternative Albums". Billboard. Retrieved June 27, 2018. ^ "Mitski – Chart history: Heatseekers Albums". Billboard. Retrieved June 27, 2018. ^ "Mitski – Chart history: Independent Albums". Billboard. Retrieved June 27, 2018. ^ "Mitski – Chart history: Top Rock Albums". Billboard. Retrieved June 27, 2018. ^ "Lush". Bandcamp. Retrieved May 15, 2018. ^ "Mitski - Audiotree Live". Bandcamp. Retrieved May 15, 2018. ^ Rettig, James (May 14, 2014). "Mitski – "First Love/Late Spring" (Stereogum Premiere)". Stereogum. Retrieved June 27, 2018. ^ Geffen, Sasha (September 16, 2014). "Exclusive Song Premiere And Interview: 'townie,' Mitski". Interview Magazine. Retrieved July 4, 2018. We're also excited to premiere "Townie," the rollicking second single from Bury Me at Makeout Creek. ^ Saunders, Jack. "Mitski, "I Don't Smoke"". Impose. Retrieved July 4, 2018. ^ Capri, Katie. "Stream "I Will" by Mitski". Impose. Retrieved July 4, 2018. ^ Colburn, Randall (August 9, 2018). "Mitski shares the wistful, starry-eyed "Two Slow Dancers": Stream". Consequence of Sound. Retrieved August 9, 2018. ^ "Let's Get Married". Bleachers. Retrieved April 14, 2019. ^ "Mitski - Goodbye, My Danish Sweetheart". YouTube. June 24, 2013. Retrieved May 14, 2018. ^ "Mitski - Shame". YouTube. July 2, 2013. Retrieved May 14, 2018. ^ "Mitski - Humpty". YouTube. July 17, 2013. Retrieved May 14, 2018. ^ "Mitski - Class of 2013". YouTube. July 24, 2013. Retrieved May 14, 2018. ^ "Mitski - I Want You". YouTube. August 8, 2013. Retrieved May 14, 2018. ^ "Mitski - Because Dreaming Costs Money, My Dear". YouTube. August 22, 2013. Retrieved May 14, 2018. ^ "Mitski - Circle". YouTube. August 29, 2013. Retrieved May 14, 2018. ^ "Sunday Video: Townie". Rookie. November 9, 2014. Retrieved July 4, 2018. ^ Fitzmaurice, Larry (March 9, 2015). "Mitski Gets Animated In The Video For "Townie"". The Fader. Retrieved July 4, 2018. ^ "Mitski - Your Best American Girl (Official Video)". YouTube. April 13, 2016. Retrieved May 14, 2018. ^ "Mitski - Happy (Official Video)". YouTube. May 23, 2016. Retrieved May 14, 2018. ^ "Mitski - A Burning Hill (Official Video)". YouTube. October 11, 2016. Retrieved May 14, 2018. ^ "Mitski – "Washing Machine Heart" Video". Stereogum. November 1, 2018. Retrieved November 1, 2018. ^ "Mitski - A Pearl". YouTube. January 31, 2019. Retrieved February 6, 2019. Battan, Carrie (June 20, 2016). "Reclaiming rock: Mitski uses the tropes of indie rock to make something novel". The Critics. Pop Music. The New Yorker. Vol. 92 no. 18. pp. 70–72. 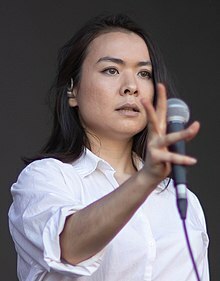 Wikimedia Commons has media related to Mitski. This page was last edited on 22 April 2019, at 02:14 (UTC).